WASHINGTON, Jan. 27, 2017 /PRNewswire-USNewswire/ -- A memory, not soon forgotten for Army veteran Tiffany Grant. She joined fellow wounded warriors to march in the inaugural parade Friday. "I wanted to take part in the parade because it was an opportunity of a lifetime," Tiffany said. 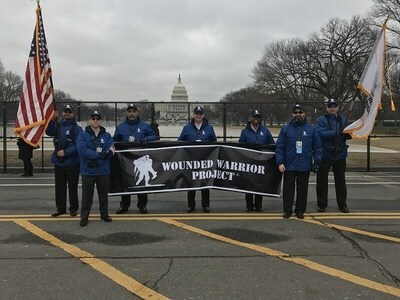 Tiffany and other veterans wore blue Wounded Warrior Project® (WWP) jackets and black hats to represent the Jacksonville, Florida-based nonprofit during the march down Pennsylvania Avenue. The new president saluted, and crowds cheered the group on as veterans felt appreciation. "The overwhelming sense of gratitude from the crowd was intense," Tiffany said. "Seeing the smiles and hearing people say 'thank you' was beautiful." These WWP warriors joined two other veterans service organizations invited by the Joint Congressional Committee on Inaugural Ceremonies to take part in the tradition that dates back to President George Washington. WWP sees value in bringing veterans together. In a WWP survey of the injured warriors it serves, more than half of survey respondents (51.7 percent) talked with fellow veterans to address their mental health issues. Tiffany first discovered WWP through her sister, another veteran who has experienced the benefits of coming together with other warriors through WWP connection events. "She spoke of the great opportunities Wounded Warrior Project offers, and suggested I join," Tiffany said. "Wounded Warrior Project provides a family away from my family. The support comes from a group that has my back." WWP advocates for the nearly 100,000 warriors it serves. In 2016, WWP helped get legislation approved to provide reproductive services benefits to veterans who lost the ability to reproduce without assistance. That benefit just went into effect last week. Read more about WWP efforts at https://www.woundedwarriorproject.org/programs/policy-government-affairs. See photos from the parade experience at http://newsroom.woundedwarriorproject.org/, and click on multimedia.